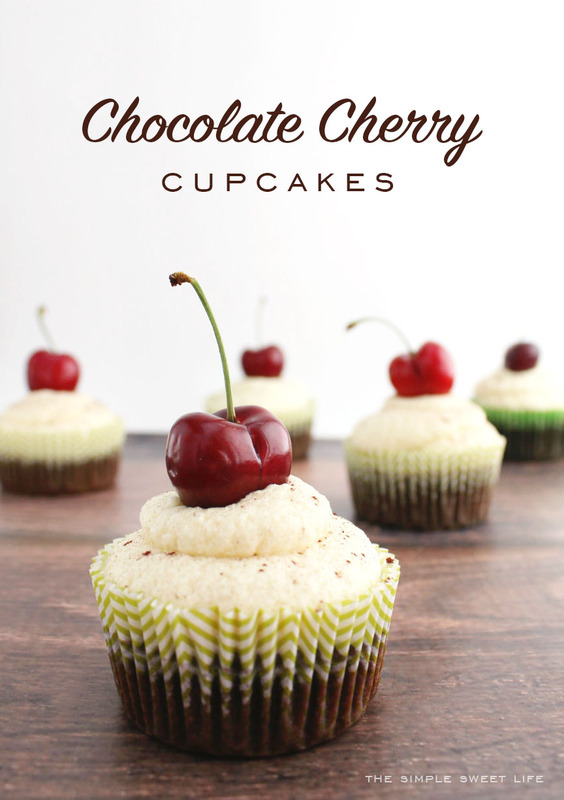 Chocolate Cherry Cupcakes – delicious dark chocolate cupcakes with a rich cherry filling and white chocolate frosting! Hello lovely Simple As That readers! 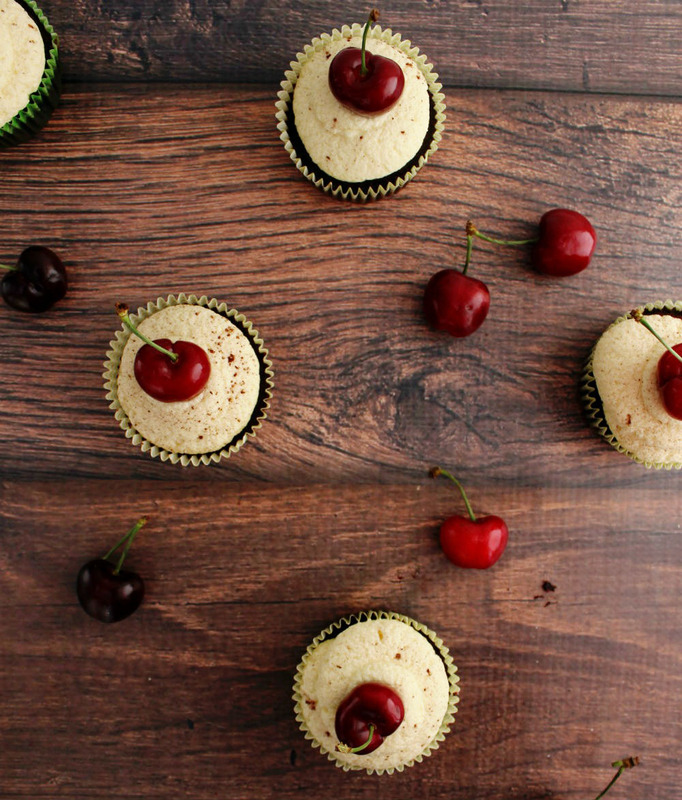 My name is Claire and I write a little baking blog over at The Simple, Sweet Life. Rebecca was so sweet to ask me to write a post for you, and I couldn’t be more excited to share this fun recipe with you today! I’m not sure how winter has been for you in your part of the world, but here in Norway it’s definitely felt long, dark, and cold! And every year, around this time of year, I start getting really excited to see fresh, local fruits and veggies appearing in the grocery stores and from the backs of vans out by the pier because it means we’re finally getting to spring and summer. Yay for long days and warmer temperatures! So with all these great fruits and veggies popping up lately, I couldn’t help but take advantage of the season by making some dark chocolate cupcakes with rich cherry filling and white chocolate frosting! To make the cupcakes, beat the eggs until fluffy. Add the oil and sugar and continue beating until just incorporated. Whisk in the rest of the ingredients until the batter is lump free, then pour the batter into a lined, standard size cupcake pan. Bake at 350*F (175*C) for 18-20 minutes, or until a toothpick inserted in the center comes out clean. To make the filling, combine your fresh chopped cherries and light corn syrup in a small saucepan. Bring the mixture to a boil and continue to boil it until you’re left with about 3 tablespoons of liquid (about 5-7 minutes of boiling). Let the mixture cool before filling your cupcakes. If you don’t have access to fresh cherries, or don’t have time to make the filling, you can use cherry jam instead. 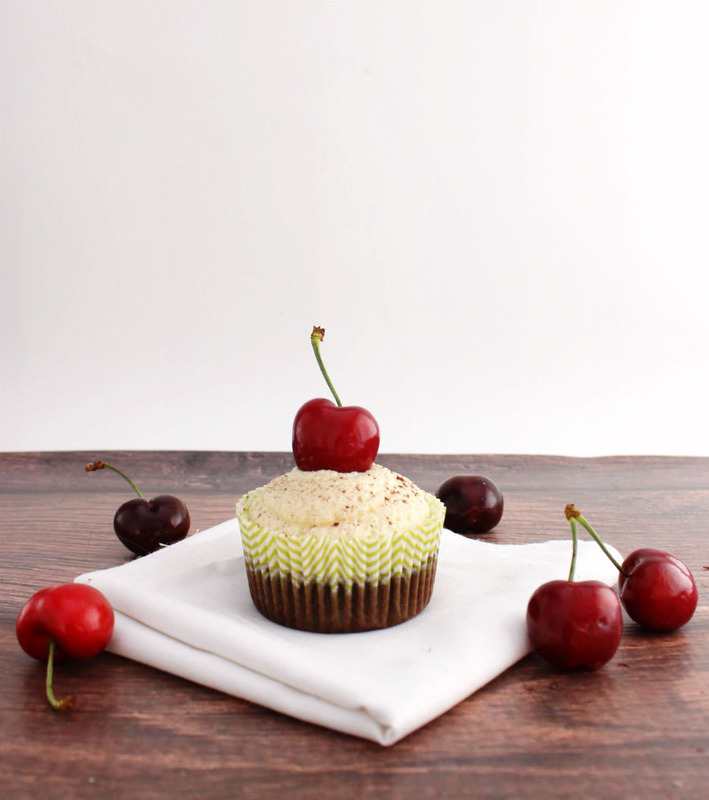 To fill the cupcakes, use a small knife with a serrated edge to cut a cone-shaped hole in the center of the cupcake. Fill the hole about 2/3 of the way full with the cherry filling and trim the top down so it fits nicely back over the filling. To make the frosting, heat the cream in a small saucepan until hot (but not boiling). In a large bowl, pour the hot cream over the white chocolate and whisk until smooth. Cover with plastic wrap pressed down against the surface of the frosting and let set in the refrigerator (about 30 minutes). Once the frosting has cooled and thickened, beat it on high using an electric hand mixer until it holds stiff peaks. 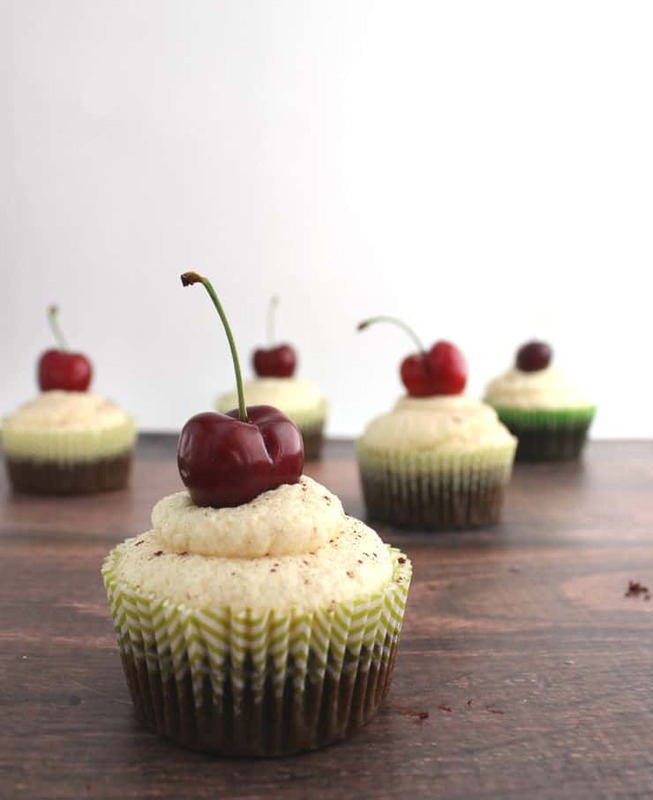 Pipe the frosting onto your cooled, filled cupcakes and garnish with baking cocoa and fresh cherries. To make the filling, combine your fresh chopped cherries and light corn syrup in a small saucepan. Bring the mixture to a boil and continue to boil it until you're left with about 3 tablespoons of liquid (about 5-7 minutes of boiling). 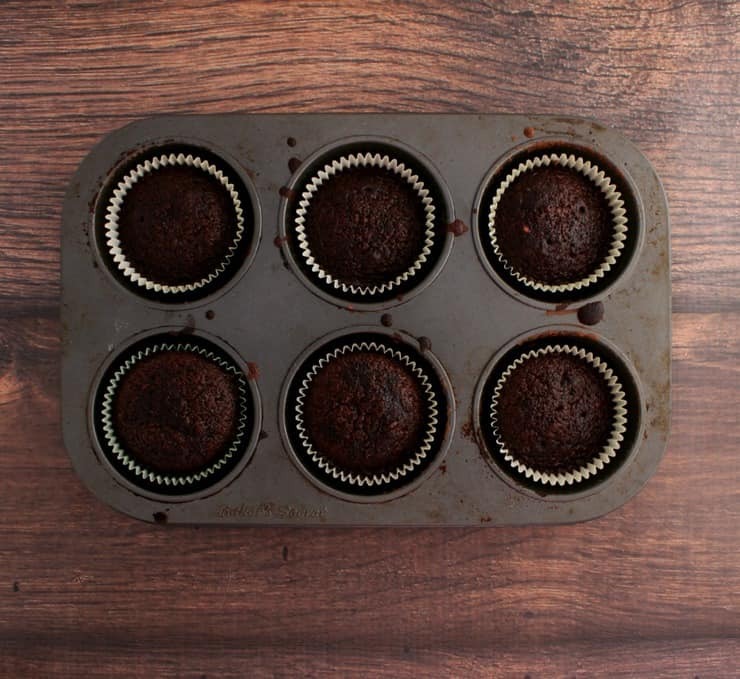 Let the mixture cool before filling your cupcakes. If you don't have access to fresh cherries, or don't have time to make the filling, you can use cherry jam instead. 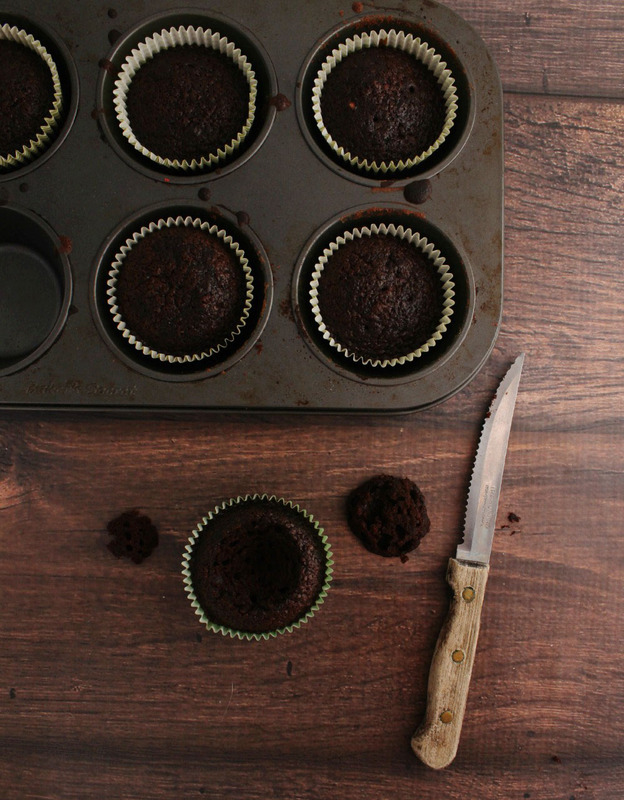 To fill the cupcakes, use a small knife with a serrated edge to cut a cone-shaped hole in the center of the cupcake. Fill the hole about ⅔ of the way full with the cherry filling and trim the top down so it fits nicely back over the filling.